An old Roman road runs along the back hillside of Isenbourg, a former advance post along an important trading route. Later, Dagobert II donated his mighty fortress, which once stood on the site, to the bishopric of Strasbourg after his son Siedberg was miraculously cured. The bishops of Strasbourg resided here until the French Revolution. The fortress was destroyed in 1822, but the 15th- and 16th-century vaulted cellars survived and are now incorporated into the château. The property fell into the ownership of a syndicate of wine traders and producers, and it remained unoccupied for decades. In 1972, the syndicate approached René Traversac, who had transformed the Château d’Artigny in the Loire Valley into a hotel, to work his magic in also transforming the Château d’Isenbourg into a luxury hotel. 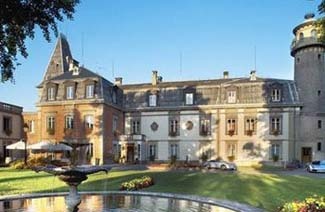 The château opened its doors as a hotel in 1974. Although less expensive, rooms in the annex can be small and in need of updating; try for a room inside the château. Be warned: breakfasts are expensive! Rouffach is 20 km southwest of Colmar. You can’t miss the hotel; it overlooks the town. Nearest train station is just 2 km. away in Rouffach. Situated with stunning views of vineyards, the town of Rouffach, and the Black Forest in the distance, the Château d’Isenbourg makes for the perfect place to relax in the heart of the Alsace region. Guest rooms come in six different standards. Some have views of the park or vineyards, while some feature a private terrace and fireplace. Decor is mostly floral. Every guest room is air-conditioned and with an en suite bathroom. Guests can discover Alsatian cuisine in the château’s two restaurants. The Louis XV-style “Salle Panoramique” looks out through enormous picture windows and over the vineyards to the old town of Rouffach. And the Salle Dagobert, with its high vaulted ceiling and Louis XIII furnishings, is configured in part of the original 12th-century structure. If the weather is fine, guests may also choose to dine outside on the terrace. Children are especially welcome at the château. Games are available, and the staff may suggest nearby suitable activities. For the little ones, a teddy bear will extend a warm welcome.